"The Half Hollow Hills program integrates a variety of...behavioral approaches...that focus on individualized goals and measurement of progress." The Half Hollow Hills School District is committed to the belief that all students should learn at their optimal level and be given the opportunity to be an active member in the least restrictive environment. Within their academic placement, our students with autism spectrum disorder are given the specialized support to meet their academic, social and emotional needs. We have created a multi-disciplinary team approach with meets the student's individual needs. Members of the team collaboratively formulate strategies, evaluate each child's curriculum, modify and/or differentiate when necessary, and continuously reassess the child's progress. Each classroom teacher has access to a special education teacher, behavior consultant, and psychologist. Staff development is an integral part of this program. All paraprofessionals are provided with training, prior to and throughout the child’s classroom experience. Weekly conferencing and training are available to all classroom teachers, special area teachers and support staff. Family involvement is another important aspect of our program. Families are encouraged to play an active part in their child’s education. Parent support groups, home visits and team meetings are in place to make our partnership program a most effective model. 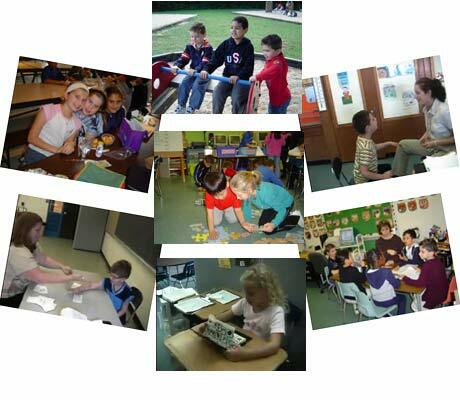 The Half Hollow Hills program integrates a variety of empirically based, positive behavioral approaches shown to be effective for students with autism spectrum disorders, and works primarily on an applied behavior analytic framework that focuses on individualized goals and measurement of progress (Baer, Wolf, & Risley, 1968). Our IPC classrooms are predicated upon the research of Ivar Lovaas (1973, 1987) which demonstrate the effectiveness of behavioral intervention on academic, social, and behavioral learning for children with autism spectrum disorder. The discrete trial teaching approach used with our students with autism is supplemented by generalization activities which occur in more naturalistic activities and settings (e.g., Koegel, O ' Dell, & Koegel, 1987), such as small group or peer-mediated activities. All related service providers receive training in the principles of applied behavioral analysis and how it relates to their instruction with students on the autism spectrum. Middle School: Middle School Career Connections students bridge academic learning with an introduction to the community. Students learn about their community and opportunities for leisure and work. Academic skills are applied within the school and community through field trips and internships in the buildings. High School: Transition services continue until students are 21 years of age through the high school's Career Connections/Life Skills Programs. Instructional activities and social skills training are embedded within the ongoing and natural routines of home, school, vocational, and community settings. A job coach is available to assist during in school, and out of school, experiences. The district social worker serves as liaison between community agencies and work sites, as well as provides support for staff. Meetings with the district social worker focus on student strengths and there is ongoing follow up for each student to assist in the transition process. We offer a 6-week program for 12 month IEP students that is a continuation of the student's regular program and related services. There is also a four week district summer school program for students placed in 15:1:1 and inclusive or general education classes. The same supports as the school year program (e.g., 1:1 paraprofessional) are continued. All students with Autism Spectrum Disorder (ASD) receive the services of a behavior consultant trained in ABA. Each family receives group and/or child specific parent training on a regular basis. An assistive technologist is available for evaluations, consultations, and ongoing training. The Half Hollow Hills District Resource Library is accessible in the district and online for parents or staff who wish to learn more about ASD, ABA, and many other topics . The district provides training in autism awareness and positive behavioral practices are made available to all district staff (e.g., administrators, special area teachers, paraprofessionals, and related services staff). The district promotes dignity and respect for all students with autism. Teaching techniques in the program focus on positive, proactive measures to build skills and improve behavior. Related service staff (e.g., occupational therapists, speech therapists) consult, push-in, and pull-out depending on a student's individual needs. Students with ASD can be enrolled in PTA sponsored clubs and activities where they can further interact with typical youngsters. Special education extra-curricular activities are also available, such as our clinical and recreational sports, and adaptive swim programs.